Three of our e-book collections are from aggregators, Ebook Library (EBL), Ebrary and Ebsco. These collections can be read online anytime anywhere on a public computer, home pc, and laptop as well as some mobile devices. Downloading and printing on aggregator platforms may be more complicated than publisher ebook platforms hence we offer the following advice. A program that allows you to view and read your downloaded eBook. Click here to download the program for free. Sign up for a free Adobe account to download eBooks onto your device. You will be required to enter and save this ID (login and password) into Adobe Digital Editions in order for your download to work. Click here to create an Adobe ID. If downloading an eBook from Ebrary or Ebsco, you will need to create a free account with these eBook aggregators. 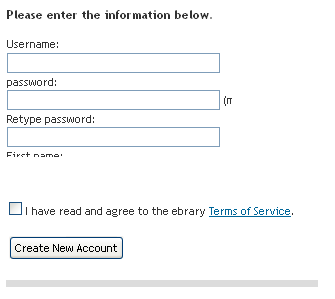 To create an account for Ebrary click here. To create an account for Ebsco click here. Please note that mobile devices have slightly different requirements (see eBooks on mobile devices for more information). EBL ebooks can be read online or downloaded. Downloading through EBL is similar to borrowing a book from the Library, and the download is visible for only a specified period of time. After teh loan expires it will disappear from your device. Selected pages can be printed either while reading online after downloading to your device. Step 1: To start your EBL ebook download click on the download button. NOTE: if using a public computer select Read Online (as a system administration password is required for all Monash and most public PCs to download). Step 2: Choose how long you want to borrow the ebook for by selecting a loan period from the drop down menu (you will have access to the e-book for the duration of this loan period, when it expires the book will disappear automatically). You need to also select the format you wish to download in. Note: For Mac users you need to use Google Chrome or Safari to print from EBL, Firefox is unreliable in this instance. Step 2: Click on the print button on the top navigation panel. You will be asked to create a loan for the book before printing. Step 3: You can print a total of 20% of the ebook, which will be shown in pages on the print options screen; in the example below 20% of the book is 71 pages. Once the loan is created the print options screen will appear that allows you to create a page range, select individual pages, or select a chapter that you want to print. Once you have selected your print options, click on Print Selected Pages, and a new window will pop-up that provides you with a preview of what you selected to print. If you receive a printing error message please clear your cache, and restart the browser. To download from Ebrary you will need to create an account. 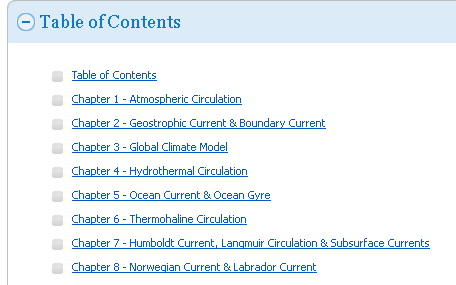 In Ebrary you can either select a Chapter to download, or choose a range of pages to download (with a maximum of 40 pages that can be selected). You can also download the whole document for a loan period of up to 14 days so long as you have the required software. Click here to check and/or download what you need. In some instances the download option has been disabled. This is because the title is only available for a single user. Printing up to 40 pages is still available in this instance. Select the type of download you require, whether its a chapter (use the drop down menu to select the chapter you want to download), a page range, or the whole document. 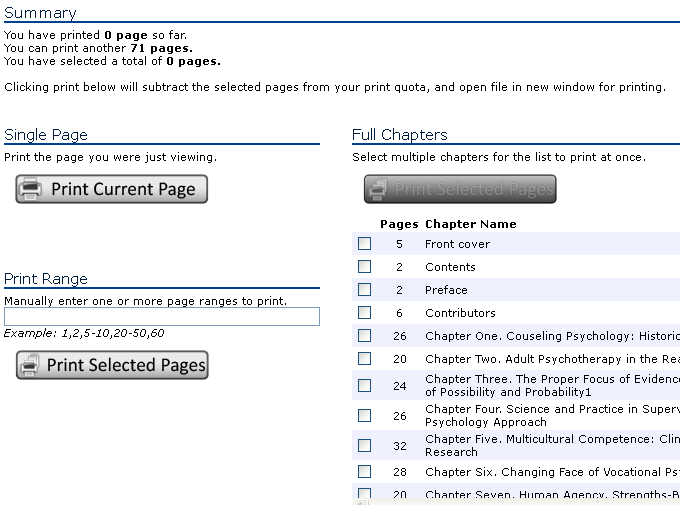 To print from Ebrary, you can either select a chapter or page you want to print, or a page range. On the right-hand panel is a list of Contents for the ebook. Click on the Chapter title to view in the panel on the left-hand side, from here you can print the Chapter you have selected. Step 2: Once you click on Print a print box will open where you can print the current page, choose the page range you would like to print, or if you have selected the relevant Chapter you can select Current Chapter. Click on the Print button. You can read online an ebook purchased from Ebsco , as many times as you wish, without creating a loan. You can do this via the eBook Full text link as pictured below. You can only view one page at a time and must load each page separately. Please note, this is because of Ebsco's viewing functionality and not because of Monash University's library management of eBooks. To view the book online you can either click on eBook Full Text, or click on the relevant Chapter in the Table of Contents. Once you are in the viewing panel for the eBook you can use the navigation down the left hand side to change what section you are looking at, and use the arrows at the bottom of the page to navigate through the pages. 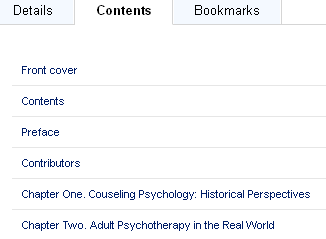 Some books in Ebsco are available for download or loan. 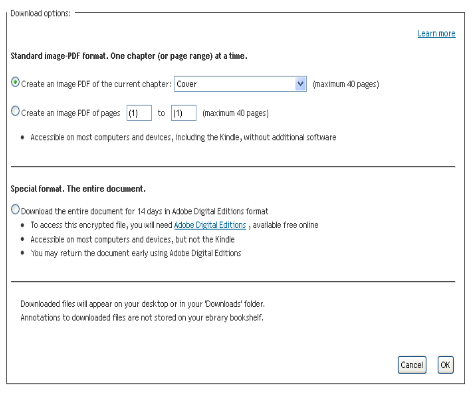 If the ebook is available to download, you will see the option as pictured below. 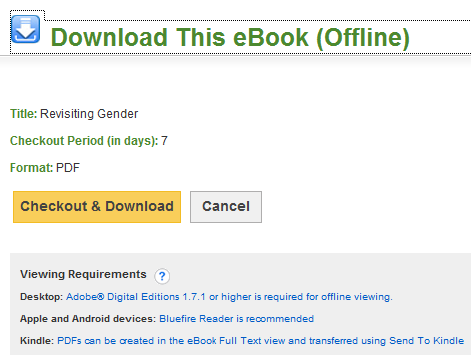 Step 1: Click on the Download This eBook (offline) icon. Step 2: A small screen will pop up prompting you to sign in. For first time users click Create a new Account and follow the prompts. If you already have an Ebsco login account, simply click Sign In to My EBSCOhost and type in your Ebsco username and password to log in and download the book. Step 3: Once logged in, another screen will pop up prompting you to borrow the book for a specified loan period (1, 7, 14 or 28 days.) and download the book. Step 4: Once your loan period for the eBook expires, it will disappear automatically. If you require the same book for longer, you may download it again using the same process. Printing is limited to a specific amount of pages, depending on the size of the book and/or copyright restrictions. As a general rule, you can usually print up to 60 pages of a title. Step 1: Click on the print button on the right hand tools panel. 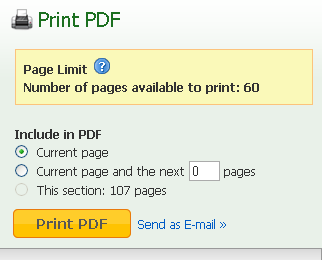 Step 2: Once you click print the below screen will appear, telling you how many pages you may print. NOTE: If a Chapter you want to print is more than the page print limit the option to print the chapter will not be highlighted (as below, the section is 107 pages, and I only have 60 pages that I can print). Step 3: Once you have identified the pages you want to print, click on Print PDF, a pdf version of the document will appear. You can either save this document or print it out. Even if you choose to not print it you have created a PDF file so it will be taken off your number of pages available to print for that particular book.